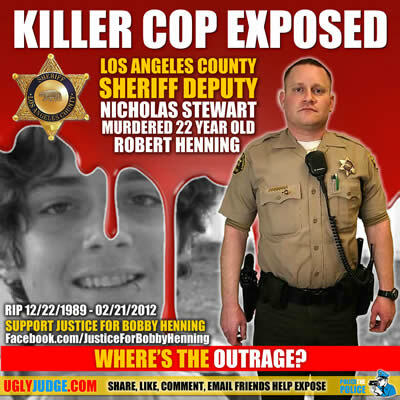 Bobby Henning was murdered by los angeles sheriffs deputy nicholas stewart feb 21, 2012. bobby was in desperate need of medical attention, but instead he was confronted by a death squad. according to an eyewitness account, Bobby was given NO CHANCE, just executed on the spot. Robert Henning (Bobby Henning), a 22-year-old man, was killed by sheriff’s deputy Nicholas Stewart Tuesday, Feb. 21, in the 16600 block of Paramount Boulevard in Paramount. The incident occurred about 12:30 a.m. as deputies were attempting to approach a man, later identified as Bobby Henning. Deputy claimed there was a struggle for his gun and the deputy shot Bobby Henning twice in the upper body. He was pronounced dead at a hospital. Two other police killing victims whose families have also been protesting together shared their birthday on the same Sunday. These include Javier “Javi” Arrazola Jr. and Robert “Bobby” Henning. Javi would have turned 25 and Bobby Henning would have turned 24. The Arrazola family attended Sunday’s event, and Bobby Henning’s family and supporters in Sacramento organized a “Winter Solstice Giveaway” in memory of Bobby. They gave away warm clothing, warm shoes, blankets, books, and non-perishable food for the homeless in Sacramento.